This garden was designed for the Quaker Concern for the Abolition of Torture (Q-CAT) as part of their campaign to raise public awareness of torture and its damaging effects on individuals, communities and wider society. 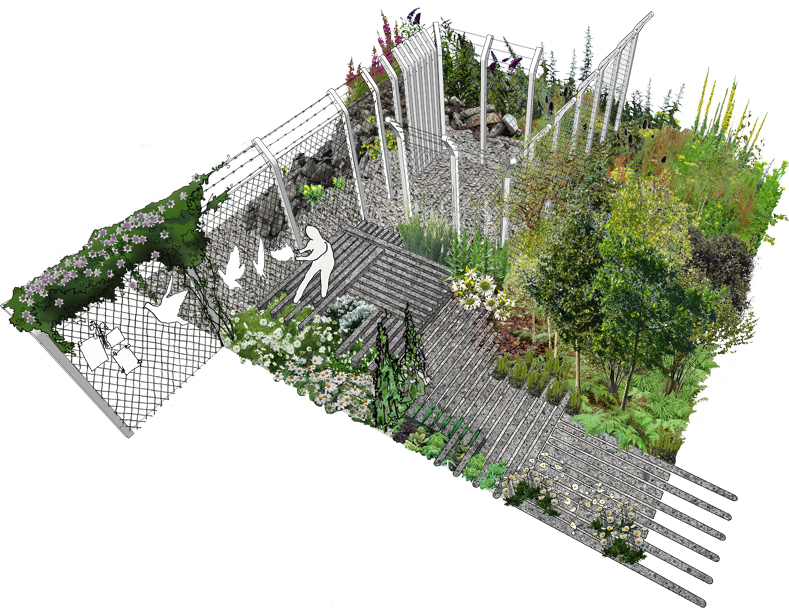 Exhibited at the RHS Tatton Park flower show, the garden was designed as an art installation that visitors could move through, experiencing the different spaces created within it. At the centre of the garden was an empty cell made from concrete posts and chain links. Within the cell visitors could hear the voices of torture victims from around the world telling their stories. The cell was surrounding by an ecological success of plants representing nature’s unstoppable power to repair itself. The visitors then moved out of the cell into a release garden full of white flowering varieties of plants first introduced into the UK by Quaker botanists. The garden was awarded with an RHS gold medal. The garden was re-located to Woodbrooke house and garden in Birmingham. © 2019 Howard Miller. Website by Duncan at Walled City.